A team of scientists from the University of Rochester, the University of Southern California, and other institutions found that ApoE4 works through cyclophilin A, a well-known bad actor in the cardiovascular system, causing inflammation in atherosclerosis and other conditions. "Our study has shown major neuronal injury resulting from vascular defects that are not related to amyloid beta. This damage results from a breakdown of the blood-brain barrier and a reduction in blood flow. A well-known genetic risk factor for Alzheimer's disease triggers a cascade of signaling that ultimately results in leaky blood vessels in the brain, allowing toxic substances to pour into brain tissue in large amounts, scientists report May 16 in the journal Nature. The results come from a team of scientists investigating why a gene called ApoE4 makes people more prone to developing Alzheimer's. People who carry two copies of the gene have roughly eight to 10 times the risk of getting Alzheimer's disease than people who do not. A team of scientists from the University of Rochester, the University of Southern California, and other institutions found that ApoE4 works through cyclophilin A, a well-known bad actor in the cardiovascular system, causing inflammation in atherosclerosis and other conditions. The team found that cyclophilin A opens the gates to the brain assault seen in Alzheimer's. "We are beginning to understand much more about how ApoE4 may be contributing to Alzheimer's disease," said Robert Bell, Ph.D., the post-doctoral associate at Rochester who is first author of the paper. "In the presence of ApoE4, increased cyclophilin A causes a breakdown of the cells lining the blood vessels in Alzheimer's disease in the same way it does in cardiovascular disease or abdominal aneurysm. This establishes a new vascular target to fight Alzheimer's disease." The team found that ApoE4 makes it more likely that cyclophilin A will accumulate in large amounts in cells that help maintain the blood-brain barrier, a network of tightly bound cells that line the insides of blood vessels in the brain and carefully regulates what substances are allowed to enter and exit brain tissue. ApoE4 creates a cascade of molecular signaling that weakens the barrier, causing blood vessels to become leaky. This makes it more likely that toxic substances will leak from the vessels into the brain, damaging cells like neurons and reducing blood flow dramatically by choking off blood vessels. Doctors have long known that the changes in the brain seen in Alzheimer's patients – the death of crucial brain cells called neurons – begins happening years or even decades before symptoms appear. The steps described in Nature discuss events much earlier in the disease process. The idea that vascular problems are at the heart of Alzheimer's disease is one championed for more than two decades by Berislav Zlokovic, M.D., Ph.D., the leader of the team and a neuroscientist formerly with the University of Rochester Medical Center and now at USC. For 20 years, Zlokovic has investigated how blood flow in the brain is affected in people with the disease, and how the blood-brain barrier allows nutrients to pass into the brain, and harmful substances to exit the brain. At Rochester, Zlokovic struck up a collaboration with Bradford Berk, M.D., Ph.D., a cardiologist and CEO of the Medical Center. For more than two decades Berk has studied cyclophilin A, showing how it promotes destructive forces in blood vessels and how it's central to the forces that contribute to cardiovascular diseases like atherosclerosis and heart attack. "As a cardiologist, I've been interested in understanding the role of cyclophilin A in patients who suffer from cardiovascular illness," said Berk, a professor at the Aab Cardiovascular Research Institute. "Now our collaboration in Rochester has resulted in the discovery that it also has an important role in Alzheimer's disease. The finding reinforces the basic research enterprise – you never know when knowledge gained in one area will turn out to be crucial in another." In studies of mice, the team found that mice carrying the ApoE4 gene had five times as much cyclophilin A compared to other mice in cells known as pericytes, which are crucial to maintaining the integrity of the blood-brain barrier. Blood vessels died, blood did not flow as completely through the brain as it did in other mice, and harmful substances like thrombin, fibrin, and hemosiderin, entered the brain tissue. When the team blocked the action of cyclophilin A, either by knocking out its gene or by using the drug cyclosporine A to inhibit it, the damage in the mice was reversed. Blood flow resumed to normal, and unhealthy leakage of toxic substances from the blood vessels into the brain was slashed by 80 percent. NF Kappa B boosts levels of certain types of molecules known as MMPs or matrix metalloproteinases that are known to damage blood vessels, reducing blood flow. Altogether, the activity results in a dramatic boost in the amount of toxic substances in brain tissue. And when the cascade is interrupted at any of several points – when ApoE4 is not present, when cyclophilin A is blocked or shut off, or when NF Kappa B or the MMPs are inhibited – the blood-brain barrier is restored, blood flow returns to normal, and toxic substances do not leak into brain tissue. For many years, researchers studying Alzheimer's disease have been focused largely on amyloid beta, a protein structure that accumulates in the brains of patients with Alzheimer's disease. The latest works points up the importance of other approaches, said Zlokovic, an adjunct professor at Rochester. 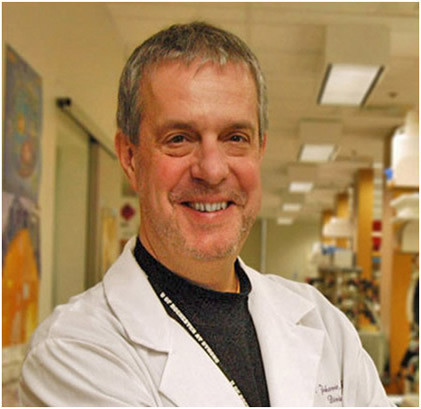 At USC, Zlokovic is also deputy director of the Zilkha Neurogenetic Institute, director of the Center for Neurodegeneration and Regeneration, and professor and chair of the Department of Physiology and Biophysics. "Our study has shown major neuronal injury resulting from vascular defects that are not related to amyloid beta," said Zlokovic. "This damage results from a breakdown of the blood-brain barrier and a reduction in blood flow. "Amyloid beta definitely has an important role in Alzheimer's disease," added Zlokovic. "But it's very important to investigate other leads, perhaps where amyloid beta isn't as centrally involved." In addition to Bell, Berk and Zlokovic, authors include, from Rochester, Ethan Winkler, Itender Singh, Abhay Sagare, Rashid Deane, Zhenhua Wu, and Jan Sallstrom. Additional authors include David Holtzman from Washington University School of Medicine, and Christopher Betsholtz and Annika Armulik of the Karolinska Institutet in Sweden. At Rochester, Zlokovic's team was anchored in the Center for Neurodegenerative and Brain Vascular Disorders, which was directed by Zlokovic, and in the Department of Neurosurgery. Bell was a graduate student with Zlokovic and now does research in the laboratory of Joseph Miano, Ph.D., at the Aab Cardiovascular Research Institute. The work was funded by the National Institute of Neurological Disorders and Stroke and the National Institute on Aging.